Connective tissues can form many diverse types and roles depending on the contents of the surrounding matrix and the cells within. Nerve cells are responsible for transmitting signals. Multicellular organisms need specialized systems in order to function as a complete unit. They contain various levels of organisation thatform a hierarchy, from cells up to the complete organism. Firstly, the cells in a multicellular organism are organised into tissues, which are groups of cells of similar appearance that work together to carry out a common function. Tissues are further organised into organs, which work as functional units. Mulultiple organs can work together to form an organ system, and systems work together to make the whole organism. However, the classification is not always this simple, and some organs contain cell types and tissues that have diverse enough functions to belong to different systems. The composition of the cells and their organelles, tissues, organs and the resulting systems is highly dependent on the functional role they have in the organism. For example, red blood cells required for transporting oxygen to other organs appear very different from the cells of the small intestine that absorb nutrients from the food we consume. 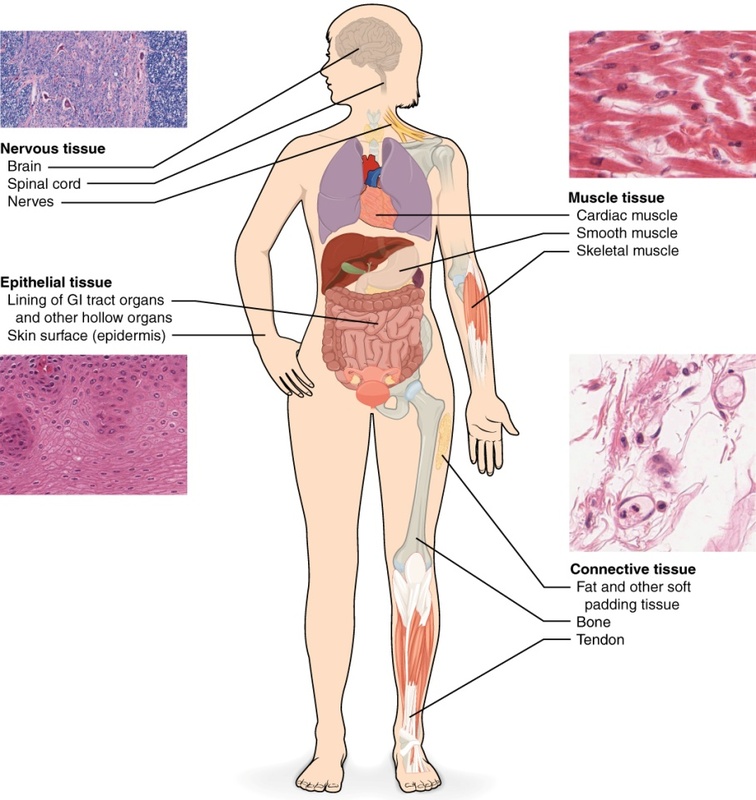 There are four broad types of tissue in an animal characterised by their functional role: epithelial tissue, connective tissue, nervous tissue and muscle tissue. These can be further subdivided depending on the specific cell types held within. Epithelial tissue (what the skin is made of) consists of cells that line organs, cavities within the body, and the surface of the body. The characteristics of epithelial tissues are that it is usually formed of sheets of tightly-packed cells that often create layers. This makes them ideal barriers to protect against injury and disease. They also have roles in secretion and absorption in other organs, for example the small intestine. Connective tissues are an important structural component in the body, and one of their main functions is to hold and connect tissues in the body to one another. A prominent feature of connective tissue is the abundance of an extracellular matrix, which usually consists of bundles of fibres in a matrix which can either be liquid, gel-like, or solid. This reflects the abundance of types of connective tissue in the body: loose connective tissue cartilage, adipose tissue, fibrous tissue, bone and blood, which all have distinct extracellular matrices. Loose connective tissue is the most abundant in the body and binds epithelial tissue to the tissues and organs within. Cartilage is mostly present in a developing embryo and matures into bone as an organism develops. However, some cartilage exists in the adult including at joints between bones. Adipose tissue stores fat, insulating the body and working as a fuel storage. Fibrous connective tissue includes tendons and ligaments, mainly providing support and shock absorption. Bones consist of mineralised connective tissue forming the skeleton, and blood has a liquid extracellular matrix (plasma) meaning it functions differently from other connective tissues, supplying the body through the network of blood vessels. Muscle tissue is responsible for the movement of the body, with specialised cells that have the ability to contract. Unsurprisingly, it takes up most of the amount of energy in animals. There are three types of muscle tissue: skeletal, smooth and cardiac. Skeletal muscle is responsible for voluntary movements, and its attached to the skeletal system by tendons. Muscle cells forming the skeletal muscle are long and arranged in fibres. Smooth muscle is responsible for contractions that cannot be voluntarily controlled, such as in the walls of the digestive system and arteries. Cardiac muscle forms the wall of the heart and contracts to allow the heart to pump blood around our body. Its properties are similar to that of skeletal muscle, but its actions are not voluntary. The human nervous system consists of the central nervous system (CNS), which refers to the brain and the spinal cord, and the peripheral nervous system, which connects the CNS to the rest of the body. Nervous tissue is composed of specialised cells which can sense stimuli and propagates signal around the body in the form of nerve impulses. Neurons are the basic units of the nervous system, and are supported by glial cells. Neurons have extensions called dendrites which transmit signals towards the rest of the neuron, and axons which transmit signals to an effector or another neuron. Campbell, Neil A., and Jane B. Reece. Biology (8th Edition). San Francisco: Benjamin Cummings, 2007.